Mardi Gras is celebrated all over the world, although its name is different in other countries. Sometimes called Carnival, Mardi Gras is the celebration time of Christians before the season of Lent. People were once required to fast from meat, eggs, and dairy products during Lent before Easter. The word carnival comes from the Latin words that mean “the taking away of meat.” Therefore, before the fasting period began, people celebrated by indulging in rich foods, dance, and masquerade. Easter occurs on the first Sunday after the first full moon, after the vernal equinox, so this is why the date is different from year to year. The 40 days before Easter is called Lent. The last day of Lent is called Fat Tuesday, which is the most festive day of Mardi Gras. Celebrations of Mardi Gras go on for a week or two prior to Fat Tuesday. Even though it is said that Mardi Gras is celebrated everywhere, the most common places in the United States revolve around Mobile, Alabama; New Orleans, Louisiana; towns along the Gulf Coast; and even into the panhandle of Florida. Festivities include parades with floats, masquerade balls, beads, King Cakes, and more. In many places, children are engaged in decorating their schools and the community with artwork. Here are a few craft ideas to implement in the classroom during your kindergarten teaching unit for Mardi Gras. Students can make their own masquerade masks from poster board. Cut out a mask shape to fit across the face. The teacher can provide decorating trims in the festive colors of purple (justice), green (faith), and gold (power). Think about gluing on sequins, feathers, lace, faux jewels, and so on. Attach a piece of elastic to each side of the mask with a stapler so it will fit the child’s head. Use tape to cover the staples to avoid scratches and pulling of hair. 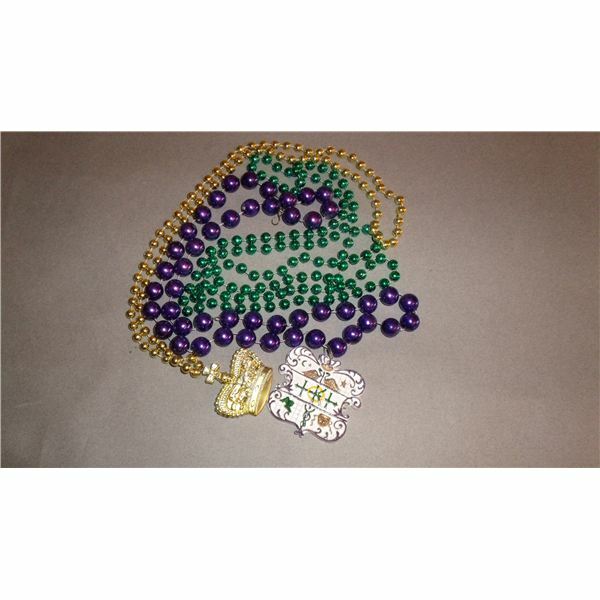 Beads are very popular during Mardi Gras and given out at parades and parties. There are two types of homemade beads that can easily be made in the classroom. You can make a clay mixture and roll beads, or string colorful dried pasta. Here is one recipe for salt dough (there are many others in art books). Mix 1-cup salt, 1/2-cup cornstarch, and 3/4-cup water in a pan. Stir these ingredients over low heat. After the mixture has thickened, in about three minutes or so, place it onto waxed paper. Let the dough cool slightly and then proceed to knead it until smooth. The children can help to roll the dough into small balls and push a plastic straw though the center to make a threading hole. Allow the beads to air dry thoroughly. Later proceed to string the beads on ribbon or yarn. Tie the ends together after loosely measuring around the child’s head for size. If you are using pasta, either purchase multicolored dried pasta or tint regular pasta by using food coloring. Dip the pasta into a bowl containing water, food coloring, and a teaspoon of rubbing alcohol. Leave the pasta in this mixture only long enough for the pasta to tint and then quickly remove it to air dry on waxed paper. Thread the pasta as the beads above. Gather several boxes of different sizes. This can be a group project or individual. Cover the boxes with tissue or construction paper in Mardi Gras colors. Glue the boxes together to make a float replica. Add decorative trims, make paper flags, use stickers, and even attach plastic people or animals to make an authentic looking parade float. Place the children’s floats along a shelf to make a street parade display. King Cakes are usually oval ringed Danish cakes filled with fruits and sweets. Americans place a small plastic baby figure inside, and the person receiving it must bake or bring the next King Cake to the parties. Children will enjoy making these crafts and treats during your kindergarten teaching unit for Mardi Gras. They will also learn about a special celebration and hopefully will encourage their families to partake in these ideas as well.